The Great Gatsby—the "NES" version, that is—started its strange life as a single screen shot, a pixelated recreation of Francis Cugat's iconic cover art for F. Scott Fitzgerald's great American novel. "It was just too funny," says The Great Gatsby NES lead developer Charlie Hoey of that artwork "all NESified and blocky with PRESS START on top of it." "I started thinking about turning it into a full game." So that's just what he did. Nine months later, Hoey and his co-creator Pete Smith released The Great Gatsby NES online as a Flash game. The 8-bit throwback that plays like Nintendo Entertainment System games of yore has since been played, liked on Facebook, and tweeted about hundreds of thousands of times. In the Great Gatsby video game, players assume the role of Nick Carraway, the narrator of Fitzgerald's novel. Carraway jumps his way through Jay Gatsby's mansion, the sewers of New York City, the Long Island Railroad and the beaches of posh West Egg. He battles butlers, hobos, flappers, leaping alligators and the disembodied glasses of Dr. T. J. Eckleburg along the way, attacking with a boomerang hat. "There's little bits and pieces of a whole lot of games we love, but we never really wanted to make it derivative of any single game," Hoey says. "The goal was more to make something that really could have been a real one back in the day." Hoey and Smith drew influence from 80s video game classics like Mega Man, Castlevania and Ninja Gaiden for their homage. "We wanted it to have the tight, satisfying feel of those games—I think Charlie nailed the feel of the hat on that score, so that it's just fun to run around hitting guys—and also to have the character and sense of place of those games," says Smith. "Your imagination pulls more weight when games have simpler graphics, and I find that actually draws you further into the environments than more realistic games often do." "It's also amazing to me how much expressiveness can come across in a face that's only a few pixels across. I'm proud of Nick's sprite because it actually seems to capture a lot of the character's attitude as Fitzgerald wrote it." 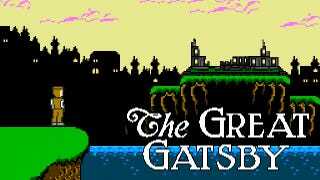 For such a simple looking game, the developers of The Great Gatsby NES say they sweated the visual details, referencing historical photos and the 1974 film adaptation of the book. "It's funny," Hoey says, "if you looked at our assets folder, there's pictures of Gatsby's house and old photos of the Long Island Railroad, we really kinda did a lot of research considering everything got down-res'd so much." "It's sort of ridiculous, but I'd catch Pete looking at a picture of Robert Redford as Gatsby, then he'd cut back to Gatsby's sprite and like, change a pixel, and nod approvingly," Hoey explains. "We argued about these things and would occasionally just catch ourselves and be like, 'Are we really fighting about how to best interpret Meyer Wolfsheim as a 16x32px sprite? That's awesome.'" The team also learned how to emulate the style and play of NES-era games on the fly, learning design lessons from games like Castlevania and Mega Man along the way: what to cut, what to keep, how to make platforming segments that felt natural in the game world. "The other thing we tried to do in the layout was make a few references—hopefully pretty understated—to NES games," Smith says, "so there's a layout in one area that's supposed to evoke the Hammer Brothers platforms in [Super Mario Bros.], and the whole look and feel of the train level is based on stage 2 of Ninja Gaiden II." The Great Gatsby NES was released in February, along with some fiction surrounding its release. Illustrator Michael DiMotta whipped up a fake magazine ad for the game and the team cooked up a story that their game was ripped from an unreleased translation of Doki Doki Toshokan: Gatsby no Monogatari—drawing allusions to NES games Super Mario Bros. 2 and Kirby's Adventure. The game's end credits make deeper references, including the names of the creators of Final Fantasy and Mega Man. But The Great Gatsby NES's creators don't limit their love to video games. Of course, they love F. Scott Fitzgerald's 1925 novel. "I first read Gatsby in high school I think," Smith says, when many young readers are exposed to—and sometimes sour on—Fitzgerald's seminal work. "[The] only thing that's been kind of sad about this whole incredible experience [...] is seeing people say the book is boring. Normally I just chalk these things up to taste, but when someone misses out on Gatsby—this amazingly acute, amazingly economical, and just gorgeously written thing, I feel sorry for them." "If the game gets some people to read the book, that's awesome. Otherwise, the response has been really fantastic, and it's been exciting to see people pick out little references to the text in our game." Despite that positive response, even from people who vocally loathe The Great Gatsby book, don't expect to see Smith, Hoey and company tackling more classic literature. "I think we're done with literary NES conversions for now at least," Smith says. "It was enormously fun but a lot of work, and I think there'd be diminishing returns if we did another. But the source is up there if anyone wants to play with it. What I'd love to see is someone converting it to run on a NES—they'd have to cut a lot of the colors, I think, but if anyone wants to try, we'll send them all the assets."